1mile² was an arts program that inspired communities to explore the diversity of people, places, nature, and the built environment in their own neighbourhood. 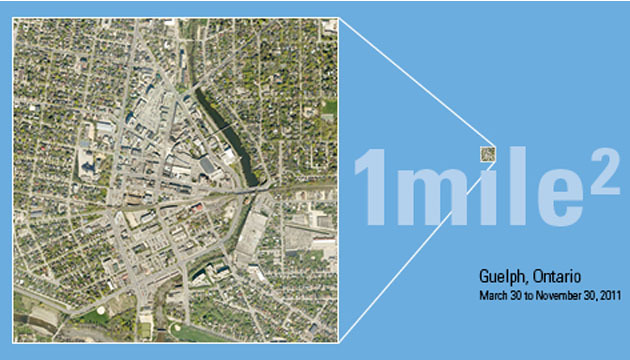 With a host of collaborators and partners, the 1mile² initiative was Musagetes’ first experimentation with socially engaged artistic practices in Guelph. Our partners in this program were Visiting Arts London UK; the City of Guelph; the University of Guelph, the department of Landscape Architecture; Improvisation, Community and Social Practice (ICASP); the Guelph Jazz Festival, Ed Video, and the Macdonald Stewart Art Centre. Musagetes set up shop in Guelph in January 2009 and since then we have been increasingly active in the community. Aims for this exploratory first set of projects were to build contact, dialogue and trust within and between communities; to encourage a sense of shared futures within communities; and to inspire learning through creative and cultural engagement and expression.